As I mentioned earlier, today was the Feast of the Most Holy Rosary. I had invited a couple families to meet us at the park, but the weather just wouldn't cooperate and so they all came over to our home instead! All I had to do was bake the cupcakes and brew some coffee. Marci brought the crafts, and Amy brought juice for the children. As soon as everyone arrived, we prayed the rosary together, and then Amy, Marci and I got to visit while the children colored pictures, made rosaries, played outside, and ate cupcakes. Here are a few pictures from our celebration. I took this photo last night to post over at Catholic Cuisine before packing it up to take to the park. When plans changed and everyone was headed over here, I decided to set it up on my hutch so we could use the table for crafts, etc. This time I decided to use frosted mini-cupcakes for the cross. "These are great! I can fit the *whole* thing in my mouth!!" The poor boys are squinting in the sun, and I *really* need to get my boys some jeans! We kept it simple, but still had an absolutely lovely time! What a great way to spend the day! We intended to make rosaries, my kids have done so before. Friday is our lighter school day so hopefully we'll make them then as we wanted to give them to friends. Looks like a great day!! 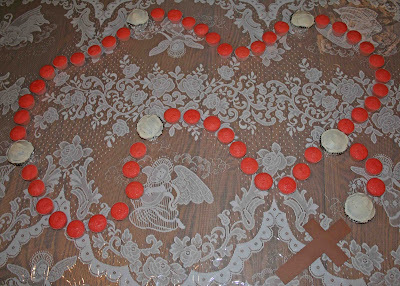 I love the cupcake rosary, it turned out so beautiful! Wish we lived closer! See Regina, we are working towards making you move back! It is all our evil plan. Can you hear that evil cackle... yes, it is us. THANK YOU SOOOO much for inviting us! I (WE) had a great time and I loved being able to visit with you and Amy, and I too wish Regina could have been there. Thanks again! No, I am not familiar with the Catholic Music Network. I will have to check it out. Thanks!